Before we even start with the review, I want to apologise for the poor quality photography. I use my iPhone for my blog photos and while the atmosphere of the Chaat Supper Club was perfect for an intimate supper club in the low-lit Silvie with tealights, this did not make for good photos. I don’t feel that my photos do the chefs’ excellent food justice, so please keep that in mind while reading through my review! Next time I’ll definitely be borrowing Jamie’s DSLR. I booked two tickets for the Chaat Street Food Feast having been reassured by them on social media that there would be proper vegan options for each of the five courses, as ‘some of the best dishes are vegan’! 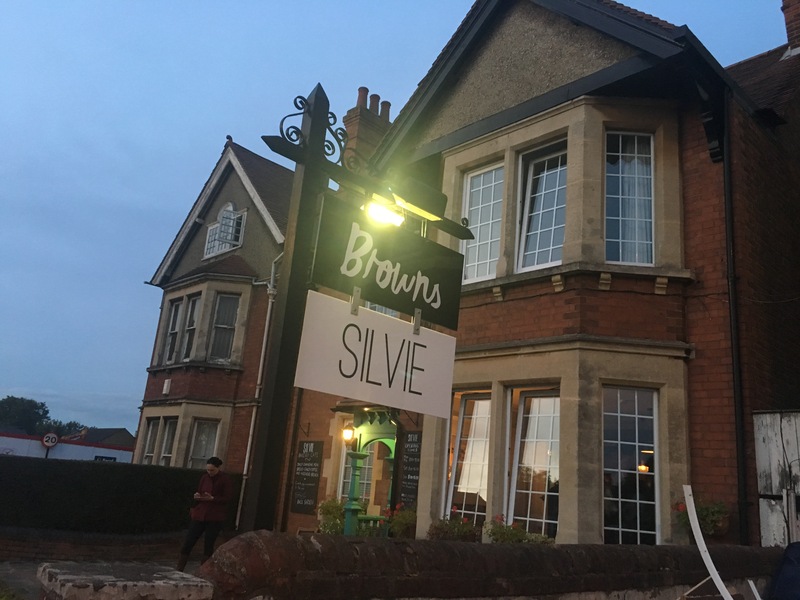 We arrived at dead on 7pm and entered Silvie, which feels like it could really be someone’s house, and things were a bit chaotic. No one checked our tickets but I think the assumption was that no one would have found their way inside the unassuming café when it was usually closed, unless they were supposed to be there. There was a small bar in the front room and a long table set up in the conservatory area at the back, and after a little confusion about how things were going to work, everyone made it to their seats. It was my first supper club and it’s an interesting setup, sharing your meal with 15 or so strangers, but the service was really well organised and it was a lovely experience. The five course Indian street food feast featured dishes inspired by food hailing from different parts of India. Our first course was Bhel puri, originating from Mumbai. A mixture of puffed rice, chickpeas, and spicy onion and tomato chutney came served in a cone, topped with a decent handful of coriander. It was a really fun appetiser and I’d never eaten something like it before which was exactly the experience I was hoping to get from the evening. It was served with a spiced cracker on the side, which tasted nice, but we felt actually it didn’t add too much to the dish and we could have done without (either that or have had a couple more). The second starter was a plate of three beetroot and carrot bhajis, served with a coconut chutney, hailing from Kerala. Jamie hadn’t read the menu and thought they were spicy falafels, and that’s quite an accurate description in terms of texture I think. The deep fried balls were crispy on the outside but, unlike an onion bhaji you might usually get from your local takeaway, they were dense and soft inside. The root vegetables used gave them a sweet, earthy flavour, with a vibrant pink colour which was really appealing, and they were packed with lots of spice. The blended coconut ‘chutney’ was quite watery but grainy at the same time, which Jamie didn’t get on with, though I and most other people on the table cleared our little pots of it – it was nice to have something cooling alongside the bhajis. Next up was the first of our main courses, a mushroom kebab served on a roti with a peanut chutney on the side, inspired by the food of Old Delhi. The roti was topped with a bed of raw and pickled cabbage, as well as a mild coconut yoghurt dressing. The mushrooms were perfectly cooked, had quite a meaty texture, and had been coated and cooked in a thick, aromatic marinade. The sweet and spicy peanut sauce accompaniment was incredible, it was creamy and the flavour packed a punch, and when poured onto the rest of the dish the spice brought everything together. Our second main course was a bowl of curry and rice, served with a lime pickle and poppadum on the side. I tried the lime pickle but it was too strong for me as I’m not a huge fan of lime on it’s own, and it was also very, very salty. The aubergine curry however was absolutely delicious. The sweet but spicy tomato based sauce, filled with a generous amount of soft melt-in-mouth aubergine pieces was beautiful, and was topped with a bit of coriander and a nice fresh salsa. Jamie had the chicken option but said afterwards he actually might’ve rather gone for the veggie curry (I’d requested one vegan and one meat option in advance – definitely my fault for not double checking with him)! To round off the meal, we had a cardamom cake topped with pistachios, from the slightly less exotic Oxford. However, it fit brilliantly with the rest of the menu, the sweet cake was subtly spiced, moist and had a beautiful texture. For me, the light flavours of the cake were slightly overpowered by the orange blossom sauce it was served with, whereas the non-vegan version was served with a less fragrant crème fraiche, which Jamie said went a lot better with the cake having tried a bit of both. However, I still devoured every crumb left on my plate as it was a really tasty dish. We were also served a masala chai to accompany our pudding, made with almond milk. It was also quite sweet, and perfectly spiced and warming, reminding me of the best parts of autumn. I had a bit of a sore throat the next day from having to shout across the table to Jamie the whole time but we both had a lovely evening and would definitely go to a supper club again. The meal was at a nice relaxed pace but the waiter did a really great job of staggering bringing out the dishes so that no one was waiting too long between courses. They kept an eye on the shared bottles of water and particularly made sure to reassure me before each course exactly what was vegan and safe for me to eat (pretty much all of it actually, with minimal adaptations). There was the perfect amount of food and I felt it was great value for money at £25 a head, especially as all the food was such high quality. You can find Chaat serving up their street food regularly at Tap Social in Botley. It’s the opposite side of the city to me but I’m keen to visit at some point to see how the food served straight out of their food truck compares to what we were served at the supper club.